Well, that's what I feel like anyway! We didn't have too much physical damage from Hurricane Irene other than a few downed branches and trees, but the storms knocked out our power late Saturday night. As of right now, Wednesday afternoon, we are still without electricity. We've been playing a lot of card games during the day and I've been catching up on some reading by flashlight after the kids go to bed. (The bonus is that they go to bed a lot easier since everything is dark by 7:45). Crafting has been limited with no hot glue gun, iron, sewing machine, etc. 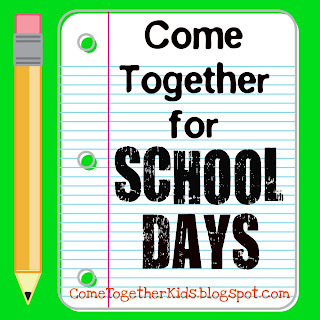 Most of our area schools were able to finally open today and we're hoping power is restored by this weekend. Until then, I have very limited internet access (I'm on the computer at the public library right now) so there won't be any new posts for a few more days. Welcome to our School Days Link Party! to have fun during the summer. as we head back to school. to link up new posts or check out new ideas. in my "Five Fun Ideas..." posts. 1. 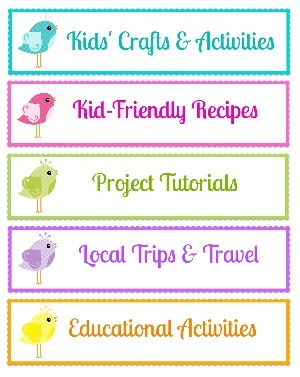 Please link to your specific blog post relating to SCHOOL ~ crafts, projects, activities or recipes. 3. Finally, the more people who link up to this party, the better it will be. 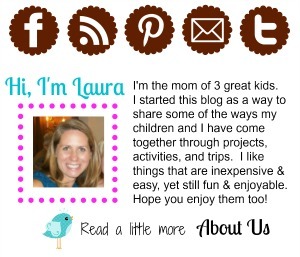 Please help me spread the word by linking back either with a text link or by grabbing a button. Fresh, local peaches are now in season here. It was a gorgeous day outside on Friday so we headed out to a local orchard for some peach picking. The kids had fun and we ended up with a half bushel of yummy peaches. That's a lot of peaches! As soon as we got the peaches home, the kids started begging me to make their peaches into a peach pie. Unfortunately, I'm not much of a baker and I know a homemade pie crust is way outside my skill set, so I set off to find an alternative that was more do-able for me. 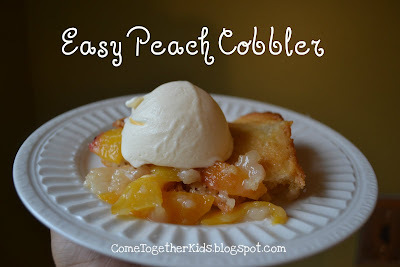 I found THIS recipe on the Food Network site for an Easy Peach Cobbler ~ what a hit!! It wasn't hard to make and we all thought it was delicious. 3. In a medium bowl, combine the flour, 1 cup of sugar, baking powder, and salt and mix well. Stir in the milk, mixing until just combined. Pour the batter over the butter but do not stir them together. 4. In a small saucepan, combine the peaches, lemon juice, and remaining cup of sugar and bring to a boil over high heat, stirring constantly. Pour the peaches over the batter without stirring them together. Sprinkle with cinnamon or nutmeg if desired ( I used a little bit of cinnamon). We have a ton of peaches left, so we'll probably make this recipe again soon and try out a few other peach dishes too. 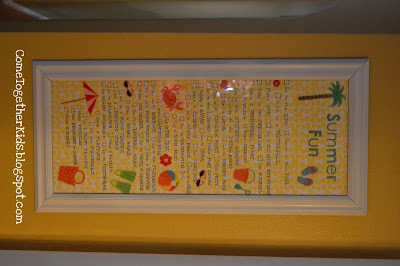 Back in June, we made up a Summer Fun Checklist with all sorts of fun activities and outings to fill our summer days. Well, with only two weeks now until school starts back up again, I'm happy to say that we've been able to cross off quite a few things. Just today, we were able to check off "Do a 1,000 PIECE PUZZLE". I'd picked up THIS United States of America puzzle and it was the perfect "hard" puzzle for us to tackle. It had so many fun images and details about the U.S., that we were able to look at the box cover and get a good idea where each piece would go. My oldest daughter really enjoyed working on it with me (the other two helped a little bit) and it only took us a couple days. 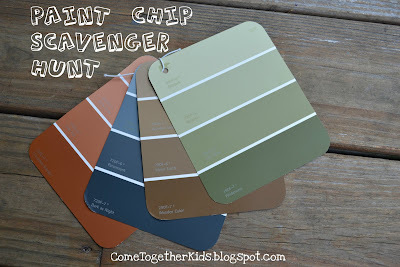 We plan on using some puzzle saver glue on it, putting it in a frame and displaying it in the playroom. 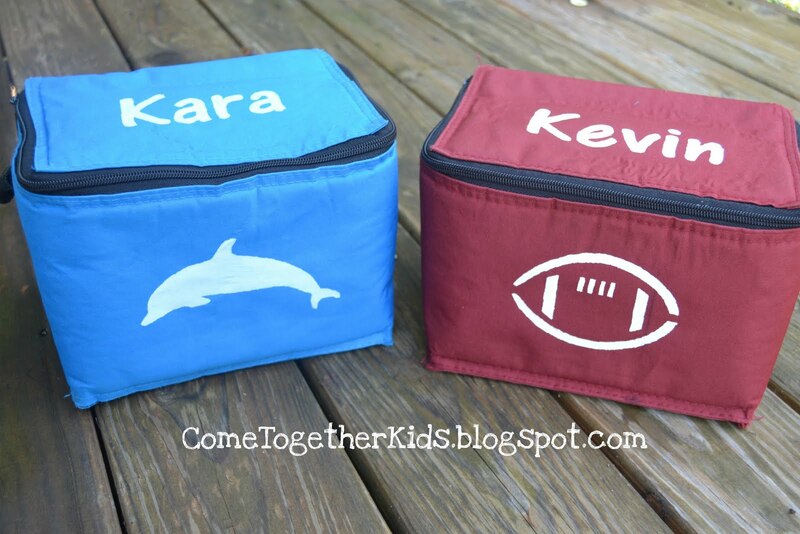 Aren't these personalized lunchboxes cute? 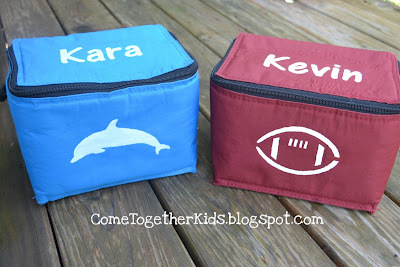 Thanks to some freezer paper stencils and a little bit of acrylic paint, I was able to turn some plain lunchbags into something special just for my kids. Last year, I ordered the kids' lunchbox sets from EasyLunchboxes.com and it worked out great for us. The prices were quite reasonable compared to others I'd seen and they held up really well. I really liked the plastic Food Containers in the set I'd ordered ~ it was so easy to pack a variety of foods in their lunches and their sandwiches didn't get smushed. I also really liked the Insulated Cooler Bags that went with the containers. The containers fit in it perfectly, with plenty of room for an ice pack, container of yogurt, water bottle, etc. I could even fit three of the plastic containers packed with snacks in one bag when we went out somewhere for the day. Cute dolphin instead of just a plain blue lunch bag! 1. I found a font and clip art that I liked on my computer. (Because the lunch boxes aren't quite as stable to work with as fabric, you'll want letters and images that aren't really detailed). I enlarged it to the size I needed, cut a piece of freezer paper to 8.5" x 11"then printed it directly on the paper side of the freezer paper. 3. With my iron on a medium heat, no steam, I ironed the stencil onto the lunchbox with the waxy side DOWN. Make sure the edges are securely adhered. I put a few books inside the lunch box so there would be a hard surface to work on. 4. Using my acrylic paint, I painted in the stencil. Don't put a lot of paint on your brush and paint from the paper in towards the center so the paint won't bleed under the stencil. See how I'm painting from the outside in? So I just held it down with a fingertip as I painted. 5. Continue filling in your stencil, adding a second coat if necessary, until you have the coverage you desire. 6. I'm never patient enough to wait for the paint to dry, so I just carefully pull off the stencil when I'm finished painting. 7. And there you have it! 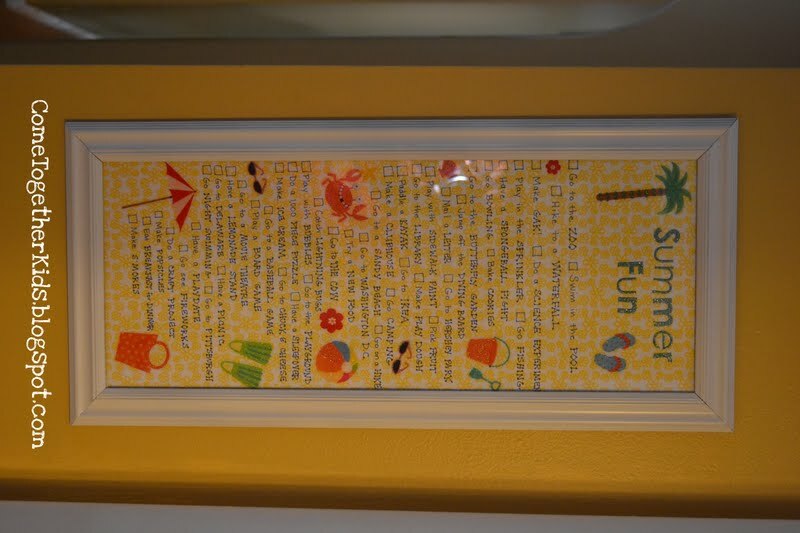 A name or image that's personalized for your child! I was really pleased with how well they turned out and plan to do some more freezer paper stenciling on some pencil cases and binders! 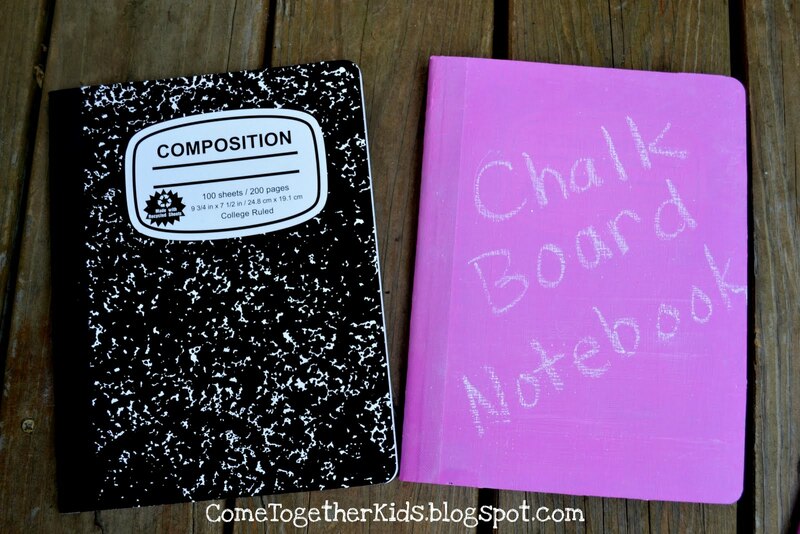 How cool is this chalkboard notebook? 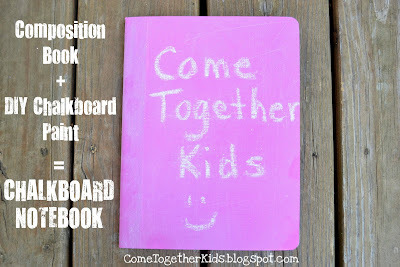 The cover of a regular composition book is painted with chalkboard paint that you can make in ANY color. Once dry, you can write messages with regular chalk, erase, and then write some more! Now, wait till you see how easy it is! Mix it up. It'll be about the consistency of pancake batter. 3. Paint the cover of your notebook. I did three coats, allowing it to dry in between. I also switched the direction of my brush strokes on each layer, first going horizontally, then vertically, then horizontally again. 4. NOTE: If you will be doing a fairly light color of paint, you might want to give the cover a quick coat of spray paint first. I was pretty pleased with the coverage of three coats of the pink, but you could still faintly see the design underneath. 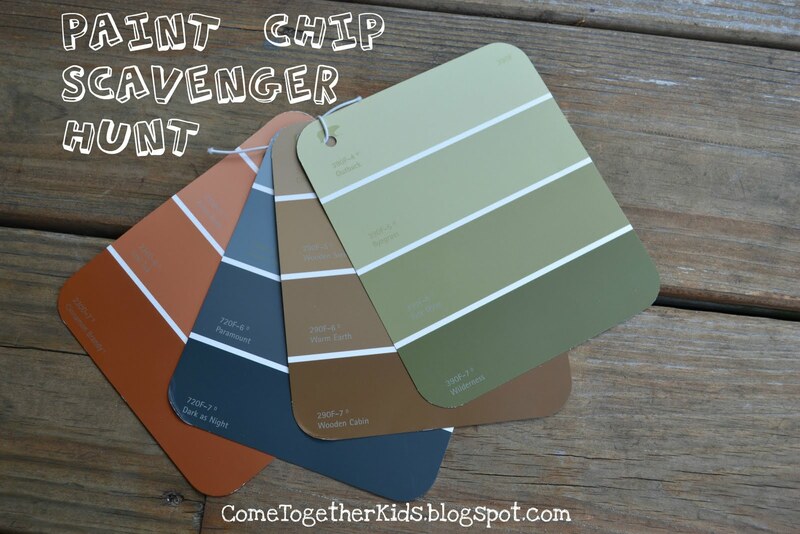 You can either do 4 coats of the chalkboard paint, or "prime" it with a coat of spray paint. The notebook on the right had a coat of white spray paint first. 5. 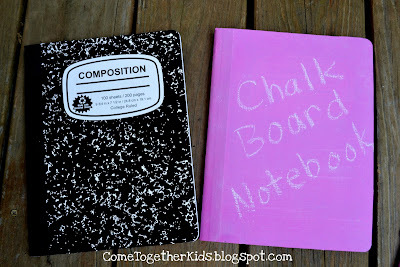 Allow the chalkboard paint to dry completely, then prepare the surface by rubbing it with a piece of chalk held sideways. Cover the entire surface, then erase it ( I used an old sock!). 5. Now you're ready to use your new notebook! You can write new messages and then erase it over and over again. I'm definitely going to be testing this out on other school supplies too. 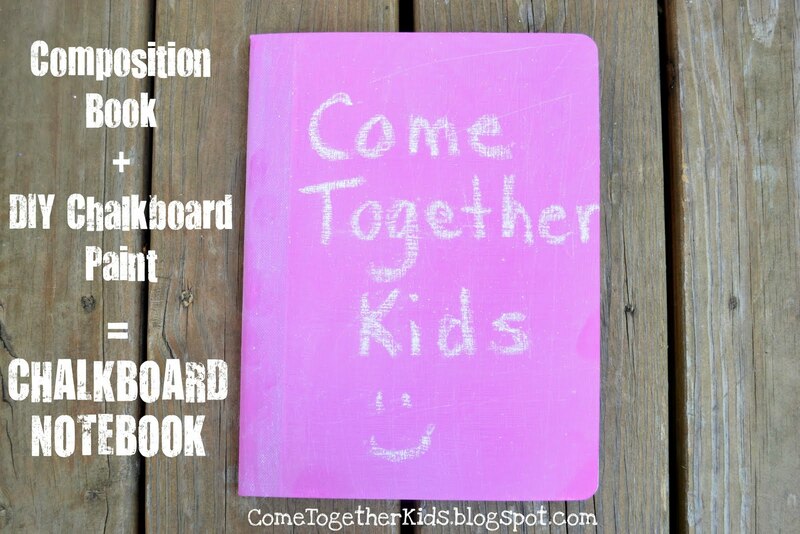 It worked well on the composition books because they have a thicker cardboard cover and the surface isn't too glossy. I did try it on a folder and it worked pretty well, although the paint did warp it a little.